Location: From Kamloops travel west on the Trans Canada Hwy #1 for 11.4 km. (7.1 miles). Turn south onto the Coquihalla Hwy #5. Take exit 336 off hwy 5 and drive northeast a very short distance (1km/.6 miles). Turn south (right) and follow this road to the boat launch, approximately 35 km. (22 miles) from Kamloops. 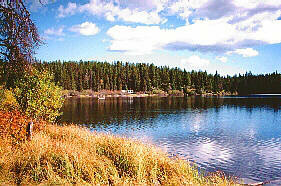 Resorts & Campsites: There is a BC provincial day-use park located on the north side of the lake. Facilities include a boat launch and recently constructed pier. Fishing Report: A great family lake offering a large abundence of trout that average in the 1 lb. range with the odd one reaching 4 lbs. Walloper contains good populations of freshwater shrimp (scuds) and leeches making it an excellent choice for the fly fishers. The lake has an aerator to avoid winterkill of the fish stocks. Caution should be exercised in the winter because of the danger of open water created by the aerator. Viewscape: Located on the Nicola Plateau, part of the inerior plateau physiographic region, the lake lies in gentle rolling hills forested in lodgepole pine, douglas fir and patches of aspen with engelmann spruce and willows in wetter sites. Patches of wild rose and red orsier dogwood are found as undergrowth. Grasses are the main ground cover with sedges in the moister areas. Shoreline: The drop-off is gradual around the shore except off the points on the southeast side of the lake. Most of the shoreline is till and has a well developed fringe of sedges, bulrushes and short willows. Boulders and cobbles are common along the steep drop-offs and the northwest shoreline. Two rocky points and a stretch of shoreline on the northeast are free from this fringe due to a steep drop-off. The east and west ends are flat and marshy. Many snags and wind falls are found along the shoreline area and there is large area of aquatic plant growth in the shallow areas and bays. Surrey, Sussex and Frogmoore lakes - Surrey, Sussex and Frogmoore lakes are located south of Walloper on an access road south off of the Lac le Jeune road. Elevation is around 1395 m. (4576 ft.) and ice over is from November to mid May. Surrey and Sussex are 55 ha. (136 ac.) and 25 ha. (62 ac.) respectively. Frogmoore lakes, a pair of lakes, total 80 ha. (198 ac.). 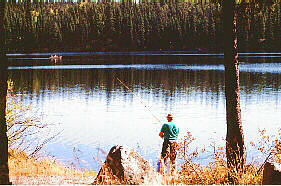 Fishing is consistant and fast throughout the season, for smaller trout in the 1 -2 lb. range. Surrey lake has a fishing camp with cabins and boats while Sussex has a small BCFS campsite with cartop boat launching. Rough camping is available at Frogmoore. 4 x 4's , may be needed getting into Frogmoore lakes.